If I had a $1 (or a £1) for every time I’ve been asked that question…. As far as The Two Trap Greyhound System goes a good trade is when you’ve done all your due diligence in terms of the research, you’ve checked the race meetings for the day, found the cards where The Two Trap Greyhound System has the highest probability of success! You lump on (as the old English saying goes) in line with your strategy… sit back for the results of race 1 and…..
Race 1 wins! 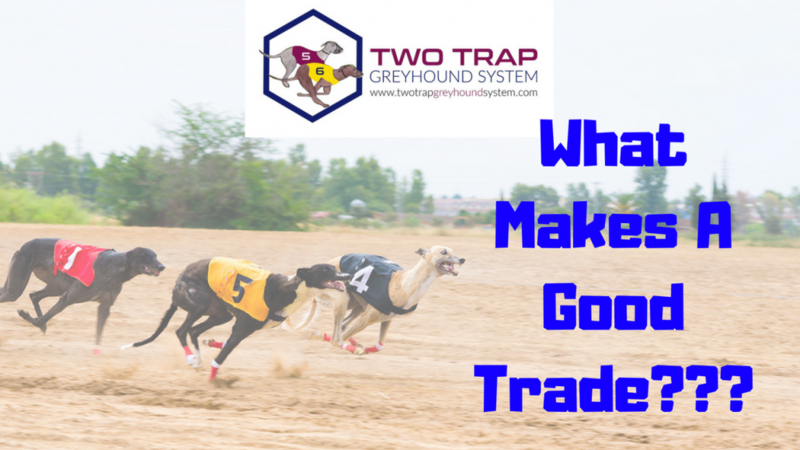 You do the golden rule of following The Two Trap Greyhound System and stop at a win! Great, brilliant, you now have the rest of the day to do what you want. Now – that’s a good Trade! There’s an even “gooder” (is that even a word?) trade. You already get the research done for you email alert at the start of the week, in plenty of time for Monday’s meetings. You look for the ‘Top’ selection, then follow as above! Now we all know that no system is 100% perfect! No I am NOT guaranteeing you win every race, but if you already follow The Two Trap Greyhound System you know how to trade to the win. The Two Trap Greyhound System is evolving (as all good systems do) and we’ll be making some enhancements to the guide to improve our greyhound betting systems that win, the calculator and the member area in the coming weeks. If you haven’t already ‘got in’ then you are missing a big opportunity! Believe me I know what’s coming!